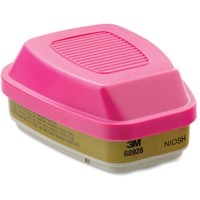 Multi GasVapor CartridgeFilter helps provide NIOSH approved respiratory protection against certain organic vapors, acid gases and particulates when used properly with 3M Half and Full Facepieces 6000, 7000 and FF 400 Series with bayonet filter holders. Acid gases include chlorine, hydrogen chloride, sulfur dioxide, chlorine dioxide, hydrogen sulfide, ammonia, methylamine, formaldehyde or hydrogen fluoride. Cartridge is suited for a variety of applications, including petrochemical and chemical processing, utilities, pharmaceuticals, mining and primary metals. Cartridge is not designed for use in environments that are immediately dangerous to life or health.